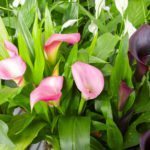 Why are only some of my Calla Lillies drooping? I water them about every other day- some of the Lillie’s are doing well, but others are dropping over. Suggestions please! They are likely being overwatered. They will only need to be watered with the top 2 or 3 inches of soil are completely dry. It will not have enough time to dry down to that depth within 2 days, unless it is hot and very dry. Even then, you will still want to check to make sure that there is no moisture within the first two inches before watering again. Although these like to be moist, they will need some dry time in between watering, as this is how the soil's oxygen content gets replenished.